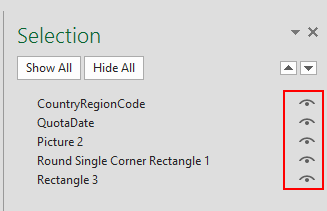 I wrote a blog post about the Selection Pane in Microsoft PowerPoint a while ago. You can read it here. Now since this is such a great tool for your Office applications I think you should use this in Microsoft Excel as well. 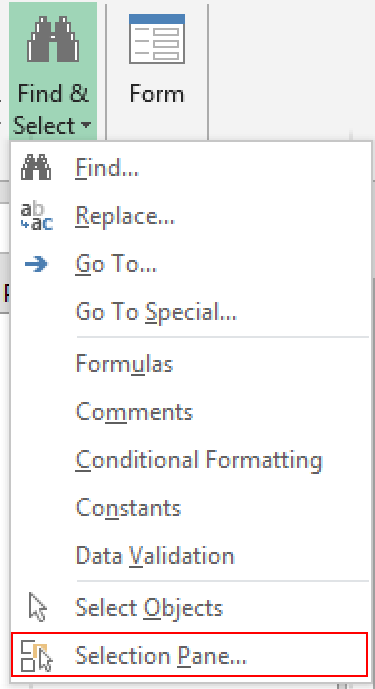 But to my surprise a lot of people don’t know about this great feature in Excel. So to get this cleared I will show you how you can use this in Excel. Scenario: a dashboard with some objects in it. Suppose you are creating a nice looking dashboard in your Excel sheet. You add a couple of nice boxes, pivot tables and a picture. After examining the dashboard you see a couple of things you might need to add to the sheet. In most cases the shapes get in the way. You may have to move them around a bit to get to the part of the sheet where you need to add additional info. After adding the additional information you have to move back everything into its original place. This can be a time-consuming task just to make the dashboard look more like you want it to. Here is where the Selection Pane comes into play. Let’s take a look at an example. This dashboard has several objects to play around with. Now to reveal those go to the Home tab and at the far right you will see the button which says “Find and Select“. From this button choose the last option: Selection Pane. There you go. You are presented with a selection pane which reveals all objects on that specific sheet. Now let’s see what we can accomplish by clicking on the little ‘eye’ icons on the right of the displayed objects. In our example we see that ‘rectangle 3’ is covering our cells. If you wanted to change the field name from the small pivot table just above the second slicer you had to remove the rectangle first. By clicking on the ‘eye’ icon of the rectangle 3 object you see that this is object is temporarily hidden. You can make all the necessary changes you would like without having to move the rectangle out of its original place. When done all you have to do is click once more on the ‘eye’ icon in the selection pane and the rectangle will be shown again! So instead of moving all your objects around your sheet to get the task done give the selection pane a chance to prove itself to you. You will see that it makes your live a whole lot easier. This entry was posted in Excel, Office Tips and Tricks and tagged dashboard, Microsoft Excel, Objects in Excel, Selection Pane, Selection Pane in Excel, Show and Hde objects in Microsoft Excel on April 3, 2015 by Maurice.